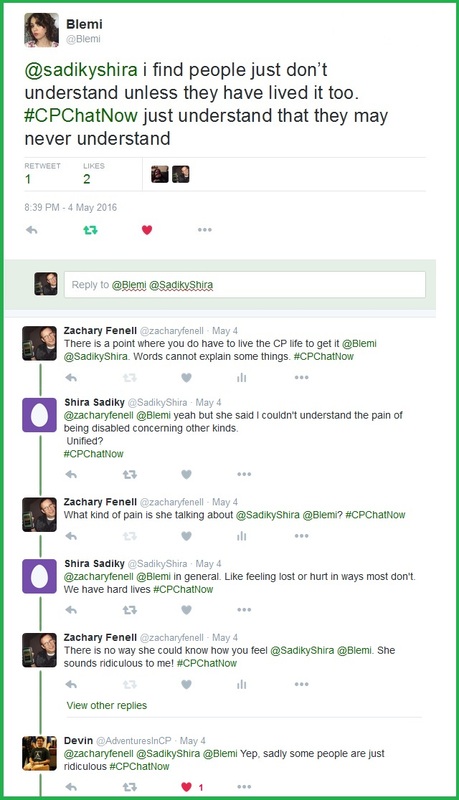 Week after week #CPChatNow offers the cerebral palsy community a place for support, advice, and understanding. Proud chat co-founder and co-host Zachary Fenell here to catch you up on the latest. Now before I continue with the May 4th recap, let me share a disclaimer. Life gets in the way sometimes. Busy schedules causes the occasional Twitter chat to end up uneventful. 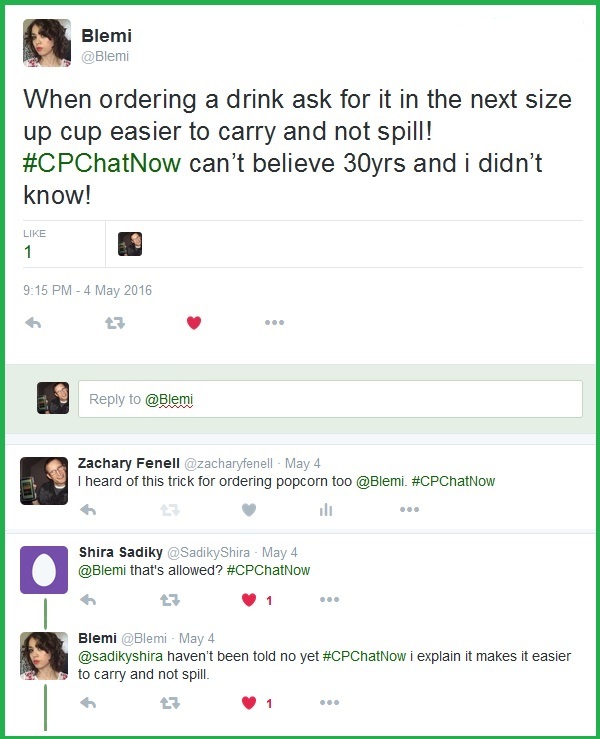 That proved the case with the April 27th #CPChatNow. Hence no April 27th recap. Yet do not mistaken a down week for lacking interest in the Twitter chat. May 4th demonstrated our value to the cerebral palsy community. A newcomer joined in, seeking advice. 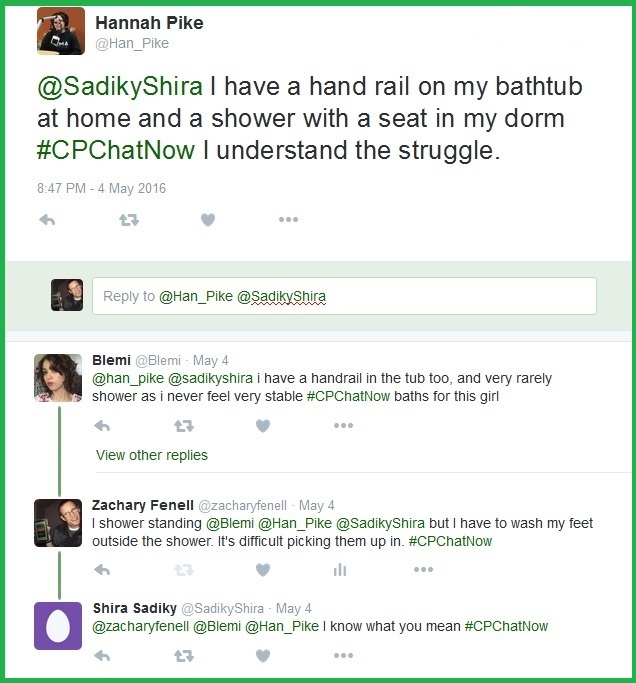 An interesting aspect to #CPChatNow forms with the twists the dialogue takes. For instance, the showering issue cited above led to a full fledged conversation on said subject. Would you like to contribute to the discussion? 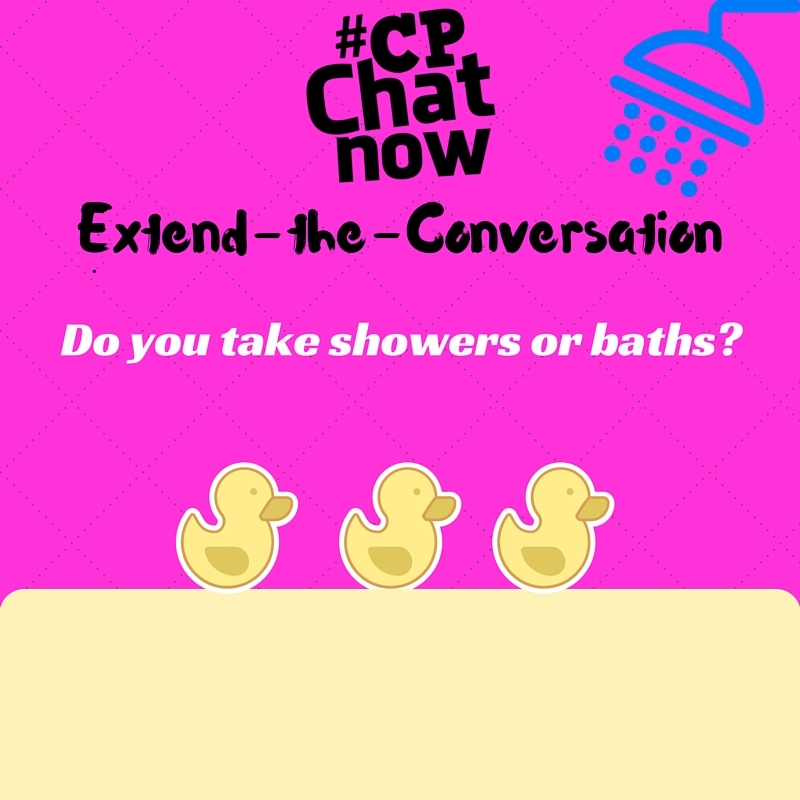 The extend-the-conversation question enables you too! Answer “Do you take showers or baths?” Leave your answer in the “Comments” section. Moving on, our community includes various age groups. Therefore understanding can lead to another feeling. I am talking about hope! 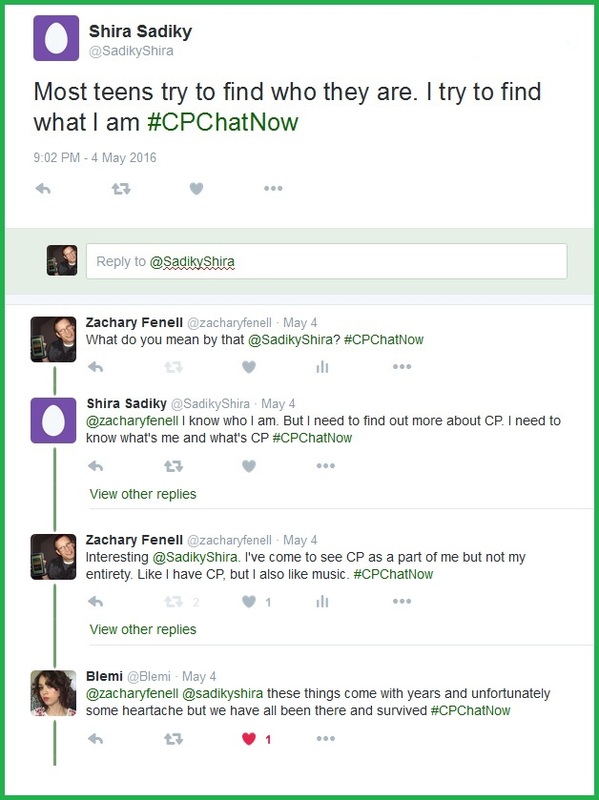 Between the shared advice and understanding, participating in #CPChatNow stands a joyful experience. A claim backed up by participant feedback! Speaking about advice, another useful tidbit emerged from the May 4th chat. Also on May 4th my co-host Blake Henry and I surprised our community with a couple announcements. The first announced the next focus chat, which we actually held Wednesday, May 11th. Blake led us in a chat on the benefits of community service. Stay tuned for that recap! 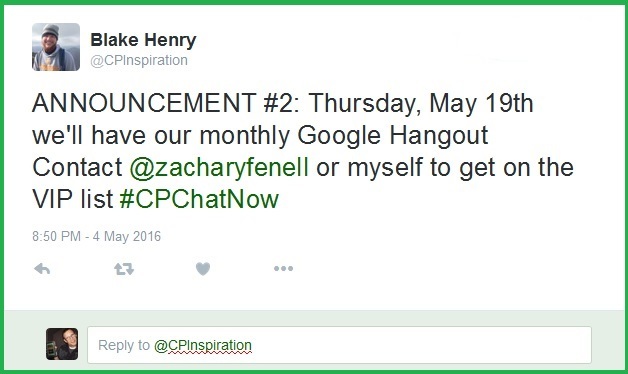 Secondly, Blake announced the date for our May Google Hangout. Google Hangouts allow us to talk face-to-face via video chat. Please send me a direct message on Twitter if you want to receive the Google Hangout invite. For privacy reasons we do not publicly share the Hangout’s link. Respond via a comment below. Thanks for reading. Talk again soon! 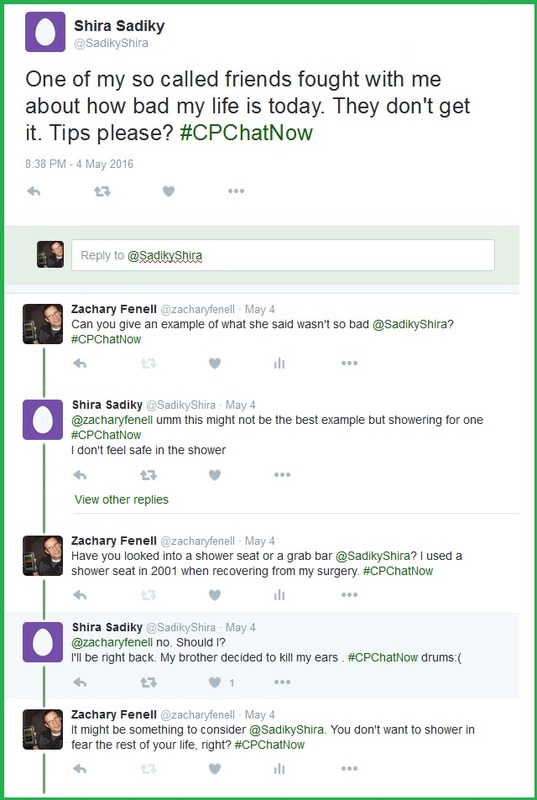 This entry was posted in Weekly Recaps and tagged cerebral palsy community, showers or baths. Bookmark the permalink.